Covalence allows companies to better assess reputational risks by helping them monitor their performance on ESG matters through benchmarking, research and ESG news monitoring services. Our ranking service enables corporations not only to monitor their ESG reputation but also to benchmark their performance against peers and improve communication with internal and external stakeholders. 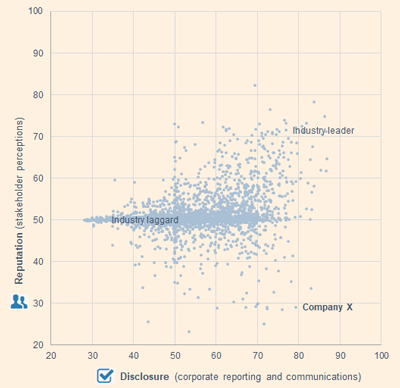 It helps companies understand and track the balance between positive (endorsements) and negative (controversies) news that is associated with the company. Covalence ESG snapshots capturing ESG performance information are a core feature of this service. Our bespoke Company Reports provide a deep dive into what could affect a company’s ESG reputation: controversies and issues affecting the company and the way in which its sustainability initiatives and credentials are portrayed in the media. These reports include ranking results and sector analysis but also a deeper reputation assessment by dimensions, criteria, topics, regions and countries and by types of information sources. In addition, our research includes an analysis of the five most important topics relating to the company. Topics range from climate change and human rights to cocoa and palm oil sourcing, diversity and water pollution. Our detailed research reports can also be customised to meet your specific needs. They can focus on a specific sector and cover pre-defined regions, types of media or issues. The ESG News Monitor is a fully interactive platform providing real-time access to thousands of curated news items published by companies, the media and other stakeholders. Users can navigate and dig through this online content in order to rapidly generate insights of what makes and breaks a company’s reputation. The ESG News Monitor provides an easy and user-friendly visualization of the content that is fed daily into Covalence database. Users can view data and charts as well as focus on and zoom into the parameters of their choosing. All charts are interactive enabling users to filter the data in one click and apply the same to all charts in the document. Data can be filtered by: polarity (positive or negative), period of time, companies, business sectors, criteria and dimensions, topics and subtopics, keywords, location, materiality, and type of stakeholders. One can also sort the data by source, type of source and country of source. This tool includes headlines and URLs to access original articles. 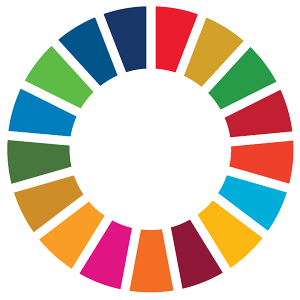 The SDG News Monitor is a fully interactive platform providing real-time access to thousands of curated news items published by companies, the media and other stakeholders. These are classified according to the Sustainable Development Goals, enabling the user to explore a company’s SDG credentials and risks, benchmark against peers and identify SDG reporting opportunities. Stakeholders such as NGOs, governments, trade unions and the media describe the role and activities of companies in positive and negative terms generating either endorsements or controversies on ESG, corporate social responsibility (CSR), ethics and sustainability issues. Since 2001, Covalence has specialized in the semi-automated analysis of such narrative content. This expertise materialized in the award-winning EthicalQuote reputation index. The approach is dynamic with rating scores going up and down all year long depending on the news flow. The system will favour companies with limited controversies (lower risk) and with active communication on their sustainability policies and practices (suggesting a proactive approach to ESG matters). Covalence helps companies understand and monitor their performance and reputation on Environment, Social, and Governance (ESG) matters. We offer ranking, research and ESG news monitoring services. Our Ranking Service allows corporations to monitor their ESG reputation, to benchmark against peers and to communicate internally and externally. The Ethical Snapshots are monthly updated. Our Company Reports help companies understand what makes their ESG reputation: the main controversies and issues and the way their sustainability initiatives and credentials are relayed across the media. 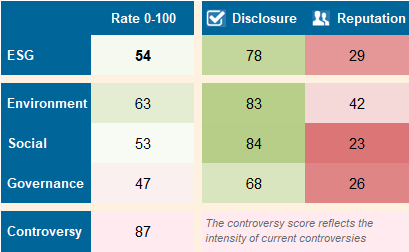 The ESG News Monitor allows companies to follow recent developments affecting their reputation – positive (impact stories) and negative (controversies). The data is classified according to 50 ESG criteria inspired by the Global Reporting Initiative and to the SDGs.